Sorry readers. I have not been writing for a while because the words became all about me. I know that God has continued my life here, not for my own enjoyment, but for HIS glory. So, I write today to update you with not only what God has continued to do with my life, but how the scripture can draw me closer to HIM. I believe I have found my answer. In Acts 12, after James had been beheaded and Peter was arrested, the church was stunned. They had been so accustomed to miracles, but now persecution was upon them. Fervent prayer was being made by the church for Peter. We must encourage each other to fervently pray, not only for large things, but the small intimate burdens of the heart. I ask you to pray, not only for me – though knowing you pray calms my fears – but pray because it binds the church together . 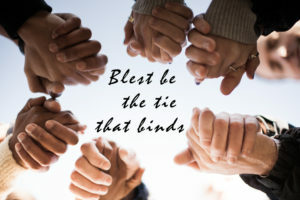 . .
Blest be the tie that binds! NOTE: I only remember singing the first verse. The others are just as wonderful, if not better. I sang this song too..many times. But the other verses have a stronger meaning now. I don’t understand the things we go through but….by the mighty power of GOD we will rise and continue as long as we have breath to do His work. I have been through some of the most challenging and faith challenging times of my life..not like yours, which I know is terribly hard but only knowing a little of what you go through is helpful to me and many others…as you keep the faith and encourage others. I can’t imagine..but you are a blessing and I am thankful for you and I am interceding for you. I’m sitting in a parking lot reading your blog while KSBJ is playing Chris Thomlin sings “You’re a Good Good Father”. Just trust Him.